Just finished this book, the second, and unfortunately to the best of my knowledge the last in the A Bridge Club Mystery series. I loved the Bridge theme. I used to play years ago and this was so much fun to “play” vicariously with Emma and her friends. The series premise is a widow moves to a new home to be closer to her best friend for support and gets involved in a local bridge club. Through her activities with the club she stumbles on murders which she solves. The character of Emma is very believable and likable. She is a widow and still grieving and that is dealt with in a realistic manner, but the book is not depressing at all. Her friends make up an eclectic group and support her sleuthing activities. In this episode, Emma travels to a bridge conference to support a friend and learn more. At the conference, a “celebrity” is murdered and Emma is right in the middle of it. The mystery is will crafted and has many probable suspects to spread suspicion among. A very enjoyable read and I am sorry that there are not going to be more in this series! 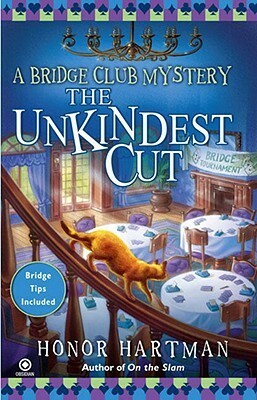 This entry was posted in Book Reviews and tagged book review, bridge, cards, mystery.